Ozhotels is a group of independently owned and non-related hotels, motels and serviced apartments located across Canberra, Australia. Oz hotels allows you to deal directly with the hotels and apartments giving you the best possible rates for this Canberra accommodation. Why deal with a travel agent when you can compare and book your Canberra accommodation online directly with the hotels and save save save!!! Regardless of whether you are a government traveller, business person or holiday maker the national capital of Canberra is a fun and exciting place to visit with lots of things to see and plenty of place to stay. Throughout the city and surrounding suburbs you will find a wide range of fully furnished serviced apartments, hotels and budget motels, so much so that finding the most appropriate accommodation in Canberra for your particular needs can be a time consuming and frustrating task. So why not save yourself lots of time and money by using the services of an accommodation expert like OzHotels in order to help you find the ideal place to stay. This service will allow you to compare hundreds of different properties located right across Canberra without calling all of the places individually. The main benefits of booking online with OzHotels is that you will be able to book up to 12 months in advance and that you will get an extra discount off the already cheap rates the longer that you stay in Canberra. The Brassey hotel Canberra is located within the central, quiet, tree lined suburb of Barton, Canberra and offers affordable heritage accommodation in Canberra. The Brassey Hotel is ideally located just 7 minutes from the Canberra CBD, 10 kms from the Canberra Airport and only 1km from the Kingston Train Station. 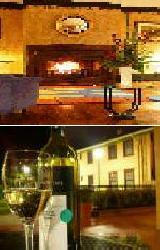 Fantastic Canberra accommodation at very affordable prices. The Belconnen Apartment Hotel Canberra provides travellers to the ACT with comfortable discount accommodation only minutes from the Canberra city centre. Also close by to the Belconnen Hotel Canberra are the Australian National University, Canberra University, Telstra Tower, Australian Institute of Sport and the Hawker shopping village with restaurants, supermarket and a variety of shops. 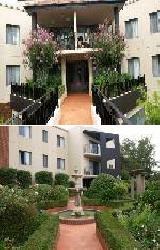 This Belconnen apartment hotel has rooms to suit everybodys needs including 2 bedroom fully self contained serviced apartments as well as discount hotel style rooms. 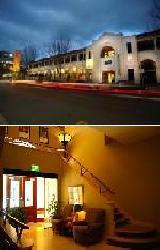 Great value Canberra accommodation rates are available online for longer stays. The Apartments by Nagee Canberra provides luxury, 5 star 1 & 2 bedroom serviced apartments that are ideally positioned in the heart of Canberra. Corporate business travellers, tourists, families, leisure and sporting travellers can experience world class, yet affordable accommodation at the Apartments by Nagee in Canberra. The Apartments by Nagee Canberra is close to everything that the city has to offer, and has numerous guests facilities and services including lounge bar, business centre, direct internet access, faxing facilities, free car parking, guest laundry, gymnasium, lift, restaurant, secretarial services, spa, indoor and outdoor swimming pool, bbq area, garden, baby cots for hire, babysitting service and daily housekeeping. 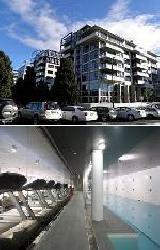 Apartments by Nagee Canberra guarantees meticulous cleanliness and will make you feel both special and relaxed. The Nagee Classic Apartments in Canberra provides a range of 1, 2 & 3 bedroom self contained serviced apartments in fantastic Canberra locations, including Canberra City Central and the suburbs of Braddon, Dickson, Civic, Turner, Lyneham and Manuka. 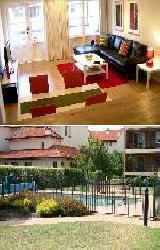 This great calue accommodation is immaculately presented at affordable prices. The Nagee Classic Apartments features a wide range of modern amenities and services such as direct internet access, free car parking, guest laundry, gym, lift, sauna, outdoor swimming pool, bbq, garden, indoor pool and baby cots for hire. 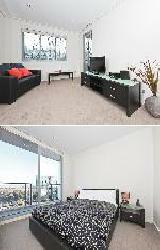 The Nagee Classic Apartments Canberra guarantees meticulous cleanliness and trend setting comfort. 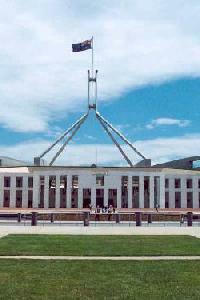 The Hotel Realm is one of the newest Canberra hotels and is ideally located on at the steps of Parliament House. It provides both business and leisure travellers with the choice of hotel rooms, hotel suites, 1 & 2 bedroom self contained serviced apartments. The Hotel Realm Canberra provides superbly located accommodation in Barton next to the Parliamentary Triangle, close to everything that the city has to offer. It also features many guests facilities and services including lounge bar, business centre, conference centre, guest laundry, gym, lift, restaurant, room service, sauna, spa, tour desk, indoor swimming pool, 24 hour reception, baby cots and daily housekeeping. The Hotel Realm Canberra Hotels offers five star business facilities including Wifi access in all guest accommodation rooms and apartments. The Abode Apartments are ideally positioned in a number of different Canberra location including Tuggeranong, Woden and Gungahlin. These modern and uniquely designed self contained apartments are ideal for tourists, leisure guests, and corporate business travelers alike. The Abode Apartments in Canberra features a wide range of studio apartments, as well as a selection of 1 & 2 bedroom self contained serviced apartments close to everything that the city of Canberra has to offer. Providing short and long term accommodation the Abode Canberra Serviced Apartments are stylish properties that are centrally located close to popular shopping, restaurant and tourist precincts. The Abode Apartments also have numerous guest facilities and services in order to make sure that you feel right at home during your stay in Canberra. Forrest Hotel and Apartments, Canberra provides excellent value for money, comfortable, friendly, family-owned and operated accommodation with the choice of 77 non-smoking hotel rooms and 1 and 2 bedroom self contained non smoking serviced apartments. 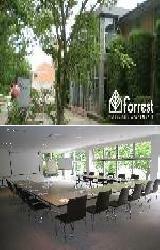 The Forrest Hotel and Apartments provides all types of travellers with discount accommodation in Forrest. It also features a wide range of modern amenities and services such as lounge bar, conference centre, direct internet access, free car parking, guest laundry, restaurant, room service and tour desk. The Forrest Hotel and Apartments also caters for business corporate clients with wired and wireless broadband internet services available in all hotel rooms, suites and apartments, faxing facilities and conference/meeting facilities. Whether your stay is for business or pleasure the Forrest offers you affordable luxury with those little touches that can make a big difference. 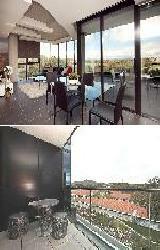 The Pinnacle Serviced Apartments are one of Canberra's best two, three and four bedroom apartments. 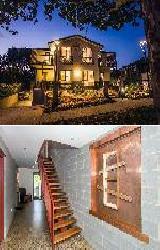 They are ideally nestled in a tree-lined Kingston street, close to cafes, chic bars and restaurants. The Pinnacle Apartments Canberra offer security and relaxation in the heart of the Australian Capital Territory and is also the perfect retreat for those travelling to Canberra on business because it is so close to the commercial hubs of Barton, Parliament House and the Russell Offices. The moment that you step inside this quality Kingston accommodation you will be delighted by the naturally lit, oversized living area. All apartments are non smoking, fully self contained and fully equipped including air conditioning, daily servicing, a spacious living area with private balcony and a fully equipped kitchen. The Pinnacle Apartments Canberra also provides a range of facilities and services for guest convenience including free car parking, fully equipped gym, outdoor swimming pool, BBQ facilities, internet kiosk, business centre, dry cleaning service and meeting facilities. Situated five minutes from Parliament House and within walking distance to the popular Kingston and Manuka shopping centres the Pinnacle Apartments Canberra are ideal for holiday makers, families, tourists, corporate clients and sporting groups. The self contained serviced apartment accommodation that is available at the City Style Executive Apartments comes in the form of stylishly appointed 1, 2 & 3 bedroom apartments that are perfectly positioned in carious key locations around Canberra. This affordable property is ideal for either a long or short term stay and all apartments are conveniently located within walking distance either to the Canberra CBD or the Parliamentary Triangle. The City Style Executive Apartments in Canberra CBD is close to everything that the city has to offer, as well as having a numerous guests facilities and services including free car parking, guest laundry, lift and baby cots available for families. The City Style Apartments provides a much more comfortable place to stay than conventional rooms, as well as real value for money accommodation all around Canberra. The Rydges Lakeside Canberra provides travellers with one of the best hotels in Canberra with spectacular views, great service and a central CBD location on the shores of the picturesque Lake Burley Griffin. This newly refurbished hotel accommodation in Canberra is ideal for corporate and leisure travellers alike and is close to all of the major Canberra tourist attractions including the new and old Parliament Houses, shopping and dining. The Rydges Lakeside Canberra also features a wide range of modern amenities and services such as disabled facilities, faxing facilities, guest laundry, lift, restaurant, room service, 24 hour reception, WIFI internet access in all hotel rooms and suites, business centre, faxing facilities, photocopying services and conference facilities. The Burbury Hotel in Canberra provides both corporate and leisure travellers with hotel accommodation and 1 & 2 bedroom apartment suites that are ideally situated right next to Parliament House. The property is located in Capital Hill Barton, which is close to Manuka Oval, Parliament House, Old Parliament House, the National Gallery of Australia and the National Museum of Australia. 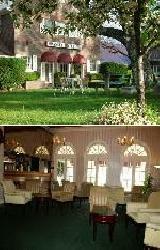 The Burbury Hotel provides also features a wide range of modern amenities and services such as lounge bar, business centre, conference centre, direct internet access, disabled facilities, faxing facilities, guest laundry, fitness equipment, lift, restaurant, room service, sauna, spa, bbq, indoor pool, security, 24 hour reception and daily housekeeping. 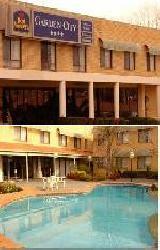 The Burbury Hotel & Apartments in Barton provides luxury accommodation in Canberra with excellent amenities and friendly service. The Astra Apartments Manhattan Canberra provides travellers with a range of executive, affordable 1 & 2 bedroom self-contained serviced apartments that are perfect for corporate business travelers, tourists, families, leisure and sporting travelers looking to stay for a minimum of seven nights. 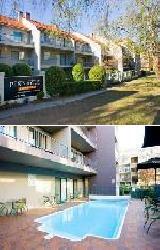 The Astra Apartments Manhattan Canberra provides all types of travellers with discount accommodation in Canberra. 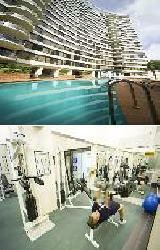 It also features a wide range of modern amenities and services such as direct internet access, free car parking, gym & fitness equipment, lift, spa, outdoor swimming pool, bbq, garden, indoor pool, security access and baby cots. The apartments are well located in Civic and conveniently positioned close to Canberra's central business district, Capital Hill, major shopping centres, restaurants, cafes and all the national galleries. The Canberra One of a Kind Apartments offer luxury, fully furnished 1 and 2 bedroom serviced apartments located just minutes from the heart of Canberra. 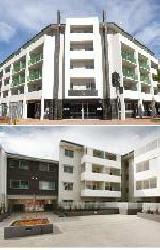 The One of a Kind Apartments provides all types of travellers with discount accommodation in the suburb of Dickson. The property prides itself on having very spacious apartment accommodation and also features a wide range of modern amenities and services such as direct internet access, free car parking and landscaped garden. The One Of A Kind Apartments is ideal for individual travellers, families and corporate business travellers who are looking for either short or long term accommodation in a great Canberra location. Red Cedars Motel Canberra is located close to Exhibition Park, the showground and the racecourse and only minutes from the City Centre. Within 2.5km from Canberra Vistors centre, the motel makes an excellent base from which to explore the many attractions and sights that the national Capital has to offer. There are many restaurants and other services that can found at the nearby Watson and Dickson Shopping Centres. 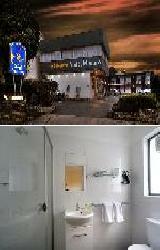 Very affordable motel accommodation in Canberra. The Astra Apartments has meticulous clean 1 & 2 bedroom self-contained serviced apartments is 2 different locations in New Acton and Civic. Both are located conveniently close to Canberra's CBD, Capital Hill, major shopping centres, restaurants, cafes and all the national galleries and museums. This makes this discount Canberra accommodation ideal for corporate executives, tourists, families and sporting travellers looking from long term stays in the city. 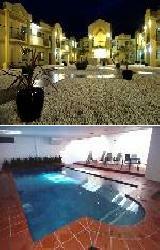 The Astra Apartments Canberra has numerous guests facilities and services including direct internet access, free car parking, fitness equipment, lift, outdoor swimming pool, bbq, garden, indoor pool, security acess and baby cots available for families. The Oxley Court Serviced Apartments provides fully furnished 1 & 2 bedroom serviced apartments with balconies in the heart of Kingston, which is just 3kms south east of the city centre. Oxley Court Serviced Apartments is perfect for a business trip, family holiday, weekend getaway or long stay and provides a fantastic alternative to traditional Canberra hotels. Conveniently located in the inner south of Canberra, minutes away from Parliament House, Barton Government Offices, Lake Burley Griffin, the National Gallery and other national landmarks. The Oxley Court Serviced Apartments in Kingston is close to everything that the city has to offer, as well as having a numerous guests facilities and services including direct internet access, free car parking and tour desk. The BreakFree Capital Tower provides 1, 2 & 3 bedroom self contained apartments in the Canberra CBD that is ideal for both business and leisure travellers. Perfectly located on the picturesque northern foreshore of Lake Burley Griffin, The BreakFree Capital Tower Canberra Apartments boast stunning views over the Lake, the towering Brindabella Ranges and the sparkling lights of Canberra. 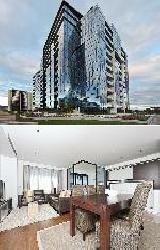 The BreakFree Capital Tower provides all types of travellers with discount accommodation in Canberra and also features a wide range of modern amenities such as direct internet access, free car parking, guest laundry, gym, lift, spa, outdoor swimming pool, bbq, baby cots and babysitting service. Quality Hotel Woden, Canberra is a modern hotel offering Queen & Twin Hotel Rooms as well as 1 Bedroom serviced apartments, located 2 minutes drive to Parliament House. The Quality Hotel Woden, Canberra is the proud winner of Canberras AHA Award for Best Accommodation 2009 and is Canberra's only four star-rated hotel located in Woden city centre. It also features a wide range of modern amenities and services such as lounge bar, business centre, conference centre, direct internet access, disabled facilities, faxing facilities, guest laundry, lift, restaurant, room service, secretarial services, 24 hour reception and daily housekeeping. All guests of the Quality Hotel Woden are entitled to Honorary Membership of the Tradies Club during their stay, who offer affordable dining and club facilities. Other attractions include Hoyts Cinema, Pitch & Put Golf, Phillip Swimming and Ice Skating Centre to name a few. The Nagee Prestige Apartments in Canberra offers guests the choice of luxury 1, 2 and 3 bedroom self contained serviced apartments & penthouses that are centrally positioned in the heart of Canberra. 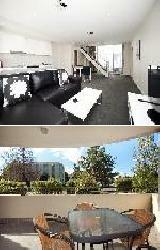 The Nagee Prestige Apartments provides all types of travellers with elegant and stylish accommodation in Manuka. It features a wide range of modern amenities and services such as lounge bar, direct internet access, complimentary car parking, guest laundry, fitness equipment, lift, restaurant, spa, outdoor swimming pool, bbq, indoor pool and daily housekeeping. Nagee Prestige Apartments Canberra also caters for corporate business clients with broadband high speed internet access in all apartments and penthouses, business centre, fax facilities, photocopying facilities and secretarial services. Nagee Prestige Apartments in Manuka would like guests to feel relaxed and special whether they are visiting for a short or long term stay. Business and leisure travellers who are looking for budget hotel accommodation in the heart of Canberra will appreciate the well equipped rooms, affordable rates and the central location of the Canberra Rex Hotel. 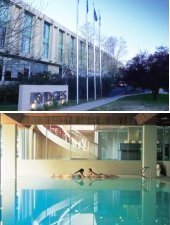 This property provides a range of different hotel rooms and is centrally located to all of Canberra's best shopping, theatres, galleries, museums, restaurants and major tourist attractions including the National War Memorial, Parliament House, National Museum & Gallery and the Australian Institute of Sport. The Canberra Rex Hotel in the CBD is close to everything that the city has to offer, as well as having a numerous guests facilities and services including lounge bar, business centre, conference centre, direct internet access, faxing facilities, photocopying services, guest laundry, gymnasium, lift, restaurant, room service, sauna, tour desk, indoor swimming pool and even a 24 hour reception. Canberra Furnished Accommodation offers modern studios, 1, 2 and 3 bedroom self contained serviced apartments in fantastic Canberra locations. The great value for money property is ideally positioned close to the Canberra CBD and the apartments are as diverse as the guests, so there is something to suit everyone. 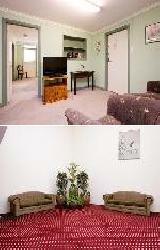 The Canberra Furnished Accommodation provides all types of travellers with discount apartments in Canberra. It also features a wide range of modern amenities and services such as direct internet access, faxing facilities, free car parking, guest laundry, gym & fitness equipment, spa, outdoor swimming pool, tennis court, bbq, garden and baby cots available. Canberra Furnished Accommodation has been creating a 'home away from home' for travellers for more than 6 years and when you stay you will discover why people keep on coming back. The Best Western Motel Monaro is a newly refurbished hotel motel accommodation that combines friendly service, affordable rates and a great Canberra location. The Best Western Motel Monaro offers hotel accommodation centrally located in Kingston on the South side of Lake Burley Griffin, adjacent to more than 30 great restaurants and only a few minutes from Parliament House, Australian National Gallery, High Court of Australia and Questacon Science and Technology Centre. The Best Western Motel Monaro in Kingston is close to everything that the city has to offer, as well as having a numerous guests facilities and services including direct internet access, faxing facilities, free car parking, tour desk, baby cots, daily housekeeping, charge back from many of Kingston's great restaurants, guest laundry, luggage storage and Wifi access. The Canberra Short Term and Holiday Accommodation in Canberra offers the choice of studio, 1 & 2 bedroom self contained serviced apartments in the heart of Griffith, which is just 5kms away from the Canberra CBD. 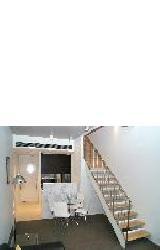 This boutique property is ideal for the budget conscious traveller and is located close to the parliamentary triangle. 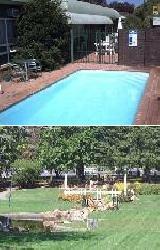 Canberra Short Term and Holiday Accommodation is perfect for a corporate business trip or holiday in Canberra, as well as having a numerous guests facilities and services including direct internet access, free car parking, outdoor swimming pool, bbq and baby cots available for hire. If you are in Canberra on business, you will be close to or within easy commuting distance of Government Offices and other business locations in the City or Woden. The Best Western Central Motel & Apartments, Canberra offers recently refurbished hotel accommodation in studio, 1 & 2 bedroom self contained apartments and affordable motel rooms. Centrally located in the heart of Queanbeyan, the Central Motel & Apartments has recently undergone a complete refurbishment and been designed with the comfort of guests in mine. 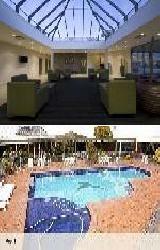 The Best Western Central Motel Apartments provides all types of travellers with discount accommodation in Queanbeyan. It also features a wide range of modern amenities and services such as lounge bar, free car parking, guest laundry, lift, restaurant, room service, outdoor swimming pool, bbq, baby cots available and babysitting service. The Best Western Central Motel & Apartments, Canberra caters for business corporate travellers with wireless internet access in all guest rooms and apartments and conference facilities. Parkway Motel Canberra is located at 8 Lowe St in the centre of Queanbeyan which is a quick 10 minutes drive to the centre of Canberra. It is one and half hour drive to the snow fields and the south coast. 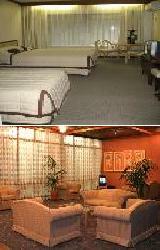 The motel has large selection of accommodation rooms including single, family and spa rooms. With 31 well appointed rooms the motel can cater for a large party, a coach or school group, individuals, couples or families. We specialise in looking after wedding groups or other family gatherings in Canberra or Queanbeyan. The Parklands Apartment Hotel is ideally located in Dickson, Canberra and is set amongst peaceful surroundings, just minutes from the CBD. It is close to all of Canberra's major attractions including Dickson's restaurant district, little China Town, the Australia Institute of sport, ACT Racecourse, Lyneham Tennis Centre, Exhibition Park, Netball Centre, Yowani Golf Course, Casino and Convention Centre. Offering a choice of modern hotel rooms, as well as fully self contained 1, 2 & 3 bedroom serviced apartments the Parklands Apartment Hotel has been specifically designed with the business, tourist and family traveller in mind. The Parklands Apartments Dickson has recently been refurbished to accommodate the needs of all guests, whether they be for short or long term stays in Canberra. The Best Western Plus Garden City Hotel is ideally positioned in Narrabundah, which is only minutes from the boutique stores, restaurants, cafes and nightlife of Kingston and Manuka. It is also located close to the Woden Valley Hospital, Lake Burley Griffin, Parliament House, Canberra city centre and many recreation attractions including golf courses, putt putt golf, shopping centres, tennis courts, casino, horseback riding and snow skiing. Corporate travellers will find that the Garden City Motel is one of the closest hotels to Fyshwick, Hume, Woden and Tuggeranong. The newly refurbished rooms at the Best Western Plus Garden City Hotel are ideal for either a short or long term accommodation in Canberra. 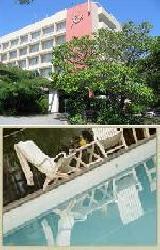 All guest hotel rooms overlook the motel's own beautiful landscaped garden and outdoor swimming pool. 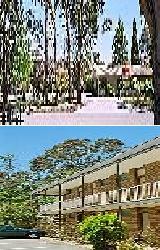 Alivio Tourist Park Canberra resort is located in the heart of the city but is more than just your standard Canberra accommodation because it is set in a delightful 9 hectare property in rural parkland. 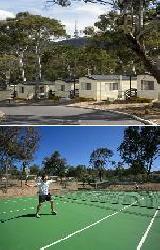 The Alivio Tourist Park Canberra is a self contained holiday village, offering a variety of accommodation styles including motel rooms and self contained 1 & 2 bedroom cabins. All guest rooms are non smoking and air conditioned with private ensuite bathrooms and wirelss internet access. They are situated in O'Connor just 4kms from the city centre and just minutes from sporting venues, restaurants, shops and most major Canberra tourist including the Telstra Tower, Australian Institute of Sport, War Memorial, Questacon, National Gallery and Parliament House. 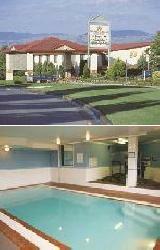 Alivio Tourist Park Canberra is is an ideal location to base your stay whilst visiting the National Capital. Located in the Tuggeranong Valley, Alpha Canberra Hotel and Apartments is only a 20 minute drive south of Canberra and 3 ½ hours drive south of Sydney. The valley is set against the backdrop of the Brindabella Ranges with Tuggeranong offering a wealth of local attractions. Ideally situated adjacent to the Town Centre Sports Club, our hotel accommodation is close to the Tidbinbilla Nature Reserve and within walking distance of extensive sporting, shopping and recreational facilities. The Mantra On Northbourne Apartment Hotel Canberra (formerly Saville Park Suites Canberra) offers a range of accommodation in Canberra's CBD, from stylish hotel rooms to fully self contained apartments. These luxurious accommodation rooms feature all of the facilities that you would expect to find in a quality 4 ½ star apartment hotel. This makes the Mantra On Northbourne Apartments Canberra ideal for business and leisure travellers needing a place to stay in the heart of the Nation's Capital. A short walk from our apartment hotel are many of Canberra's tourist attractions including the Old and New Parliament House, Lake Burley Griffin, Australian War Memorial, Canberra's National Museum and Library as well as numerous restaurants and shops in Canberra's CBD. The Quest Apartments provide travellers with fully self contained apartments in Canberra of the highest standard at very competitive discount rates. The Quest Canberra Apartments are located in the heart of city with easy access to Canberra's main entertainment, shopping, recreational and leisure attractions, as well as Parliament House which is just 2kms away. This quality Canberra accommodation consists of studio, 1 & 2 bedroom self contained apartments which are the ideal alternative to the traditional hotel room because they provide that extra space to conduct business as well as providing the option of preparing your own meals. All of the serviced apartments have been stylishly furnished to the highest standard and provide a home away from home feeling. 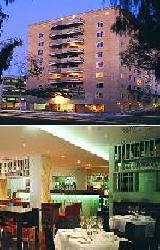 Quest Canberra also provides a wide range of facilities to suit the business traveller. Leisure guests will appreciate that this Canberra accommodation is located close to most of the city's premier tourist attractions. 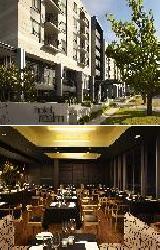 There is also eight award winning restaurants and an elegantly appointed bar located within the building complex. 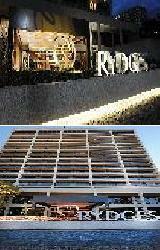 Rydges Capital Hill Hotel Canberra is a luxury 4.5 star property like no other in the Nation's Capital. 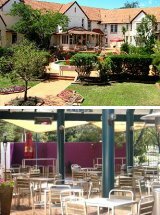 It combines a unique mixture of elegance and sophisticated Canberra accommodation, enriched by its vibrant and friendly staff. Located just minutes from Parliament House and only a short stroll to Manuka Village, with its diverse range of quality restaurants, contemporary cafes and exclusive shops, the Rydges Capital Hill Hotel Canberra is a boutique hotel nestled in luxury surroundings. With special hotel features that have been designed to enhance your stay in Canberra the Rydges Capital Hill Hotel provides an intimate setting for couples, relaxed atmosphere for business meetings and a comfortable setting for tourists. The Rydges Capital Hill Hotel has everything that you would expect from a luxurious Canberra accommodation and is the perfect base from which to explore the many attractions, museums and historic sites in and around Canberra. The Mercure Hotel Canberra (formerly the Olims Hotel) is one of Canberra's most famous and popular hotel accommodation destinations, having been classified by the Australian National Trust. The Mercure Hotel Canberra provides both business and holiday travellers with the perfect base from which to explore Australian's National Capital because it is within easy walking distance to Canberra city centre, Old Parliament House, Lake Burley Griffin, Questecon Science Museum and The Australian War Memorial. If you are looking for wonderful discount Canberra accommodation at a budget price then the Mercure Hotel Canberra is definitely the place for you. The Quality Hotel Dickson offers 4 star modern Canberra accommodation with a range of spacious hotel rooms that will spoil you for choice. 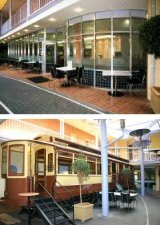 Located in one of Canberra's leading restaurant and cafe districts, the Quality Hotel in Dickson, Canberra is within walking distance to over 40 restaurants, cafe's and bars. 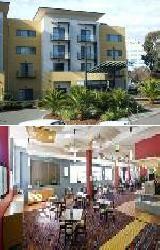 This quality Dickson accommodation caters for corporate clients, tourists, business and leisure travellers and even though it is ideally positioned in the city of Canberra, the Quality Hotel Dickson offers hotel rooms that are larger than the average hotel room. When you stay at the Quality Hotel Dickson you will receive a warm welcome, pleasant ambience and convenient facilities to ensure that your stay in Canberra is a memorable one. 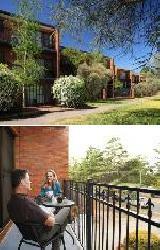 The ibis Styles Canberra Eaglehawk a truly unique resort set amongst 30 acres of natural landscaped native gardens. This Canberra hotel offers visitors to the ACT the ideal place to relax and unwind, with the recent refurbishment to the resort rooms, public areas and conference facilties. The ibis Styles Canberra Eaglehawk is now one of Canberra's leading tourist and corporate hotels with a choice of luxury rooms including Twin, Family, Superior, Garden and Spa Suites. 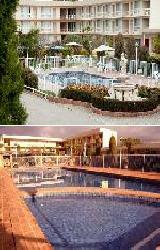 The Canberra accommodation resort includes quality hotel facilities such as an outdoor swimming pool, two flood lit tennis courts, volleyball courts, children's playground, barbeque area, gymnasium, spa and sauna. The ibis Styles Canberra Eaglehawk is situated 12km north of the Canberra CBD and is conveniently located within easy driving distance to wineries, the Australian War Memorial, Lake Burley Griffin and Exhibition Park. The Hotel Kurrajong offers boutique Canberra accommodation in a heritage listed hotel complete with period architecture reflecting the National capital's elegant history. This quality Canberra property is ideally nestled in the quiet leafy streets surrounding the city and offers the modern facilities that you would expect from Canberra's premier boutique hotel. Located on the National Circuit in Barton, the Hotel Kurrajong is only a short walk from the new Parliament House, Old Parliament House and Lake Burley Griffin. Corporate guests will appreciate the hotel facilities which include a business room with computer & printer, meeting/conference rooms, 24 hour front desk, Isabells Restaurant, lounge bar, concierge, dry cleaning & laundry service, free in-room broadband internet, 11 free Foxtel channels, gym and free off-street car parking. The Hotel Kurrajong has been servicing government, corporate and leisure guests for many years and is the perfect Canberra accommodation for the discerning traveller. The national capital of Canberra and the surrounding regions have many different places that are ideal for long or short term stays. Including the Chifley on Northbourne, Crowne Plaza Canberra Hotel, Canberra City Gateway Motel, Miranda & Parkview Lodges Canberra, Griffin Hotel Canberra, Deakin Motel Canberra, Hyatt Hotel Canberra, Medina Classic, Serviced Apartment Hotel, Canberra City Accommodation and the Ginninderry Homestead B&B Canberra. In order to book in at these or any of the other hotel accommodation in Canberra then click here to make an enquiry.